A checklist is a great tool if you’re traveling with dogs during the holidays. What you do with your checklist after your trip turns it from a scrap of paper to a compass for future trips. Nothing is worse than interrupting the fun to find a pet store in a strange town to get forgotten items. On a trip with your dogs, you want to keep life simple. You certainly don’t want to add stress to your dog. A checklist keeps you focused. How many dogs you are traveling with. How many days you’ll be traveling. How you are traveling — by car, airplane, etc. Where you will be staying — a hotel, with family, with a friend, etc. Food and water: Canned or dehydrated food? Do you need kibble? Bowls for water and food are important. 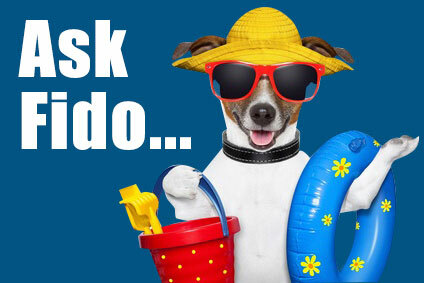 Will you need to bring bottles of water so your dog can stay hydrated while traveling? Measuring cups? Stirring spoons? Transportation: If you’re traveling by air or train, your dog may need to be in a hard-sided crate. Check the carrier’s requirements in advance. 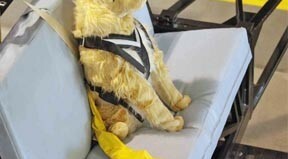 Even in a car, it’s important to restrain your dog to avoid injury in an accident. Bedding: A familiar nest or bed helps a dog feel safer and more secure. Weather protection: Are going some place cold? Wet? Hot? A coat, blankets, a towel or a cooling mat can be useful depending on your route and destination. Everyday gear: These things — leashes, harnesses, identification and poop bags — are so obvious, they are easy to forget. Don’t forget toys and treats. Medicines and supplements: If your dog has prescription medications, it’s best to bring them in the bottle they come in from the pharmacy. A dog that gets car sick or anxious while traveling, may need medications from your vet. A dog first aid kit is always good to have when traveling with dogs. Documents: Proof of shots, license information and prescriptions are important to bring. They can be a lifesaver if your dog needs to go to a vet during the trip or needs to spend time in doggie day care. It’s also important if your dog gets excited and nips someone. Don’t forget to bring your dog’s chip information as well. Having a photograph of your dog (or one of you with your dog) is important if your dog somehow gets lost. You can create a checklist on paper, as a computer file or as a cloud file using Google Docs or DropBox. Be sure to note the dates and itinerary of the trip for future reference. Make sure you can check items off as you pack so you don’t overlook anything. Make notes on your checklist as you travel for future reference. Saving the list and tweaking it based on how the trip went is important. What did you take that you didn’t need? 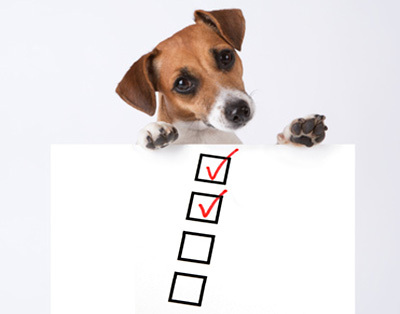 Building on experience with a checklist in hand makes traveling with your dog virtually painless. Why do I need a dog crate?